The church was officially formed in 1812, though not on this site. The original chapel was a converted barn in Mill Street at the back of The White House. When that became too small the original idea was to demolish the barn and build a chapel on the land. However, that never happened and the land on the present site became available. It was bought by the church (quite literally – people gave money as loans or gifts) and work began on the current building in 1817. 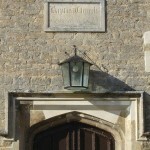 A plaque above the door shows the date of completion: 1818.The lamp above the front door of the church is a replica of one that was there during the 1800’s. It was placed there in 2004 in memory of Mr. Cyril Ashton – organist of the church during the middle of the 20th century. His sister is currently one of the life deacons of the church and our longest serving member. The step under the right hand door has been worn down by the number of people who have stood on it over the past 187 years. 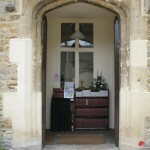 The stonework was repaired in 2001/2002 except for the stonework around the doors, which was done in 2004. Originally there was a gallery at the rear of the church over the main doors, the windows had stone mullions and there were pews. At the front was a large central pulpit, before which was the baptismal pool. Although the pews and pulpit were removed in the latter part of the 20th century, the pool remains and is still used.The mullions in the windows and the gallery were removed in 1884 when the building became derelict. The organ is a chamber organ built for use in a country home. It was electrified during the 20th century but there are those who remember having to pump the bellows. The revival around 1884/5 is covered in detail here. Many thanks to Eynsham Online for this link. There are several things that set Baptists apart from other denominations. One of the most prominent of these is the institution of Believer’s Baptism. Baptism is also about receiving God’s Spirit for service in the church and in the world. It is often accompanied by the laying on of hands as a sign of commissioning, and by being received into membership of the church. The vast majority of Christian churches affirm baptism as a moment when we receive God’s gift and respond in faith, but not all practice believers’ baptism. Many baptise those who are too young to make their own response of commitment to Christian discipleship, and so parents make promises on their behalf that are later ‘confirmed’ by the person themselves when they are of an age to do so. Many Baptists will want to welcome and affirm those who have a different story to tell of how they have been baptised and come to faith, while still declaring our conviction that believers’ baptism is the pattern that is set out for us in scripture. When a person is baptised in a Baptist church, they normally become a church member. Church members are called to prayerfully discern God’s will for their shared life. Final authority does not rest with the ministers, deacons or any other local, national or international body, but with the members meeting together under God’s guidance. Church meetings will make significant appointments including ministers, and agree financial policy and mission.